Browsing through the ever-excellent Things Magazine this morning we came across a link to Cinema Treasures, a site "devoted to movie theater preservation and awareness, uniting movie theater owners and enthusiasts in a common cause - to save the last remaining movie palaces across the country." As it's primarily a US site we turned right to the page marked UK and found the London cinemas that are listed there. There's quite a few... and so any thoughts of actually getting any real work done today went straight out the window. 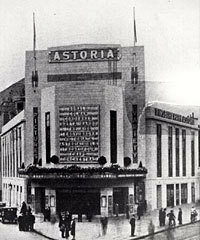 Did you know the Finsbury Park Astoria (pictured) was made famous by the Ziggy Stardust concerts? Or that there used to be a Ben Hur cinema in Stepney (it's now a snooker club)? Or that the Metropole that once stood on Victoria Street featured in the film Brief Encounter? Of course, many hours later, just as we were starting to think of maybe getting back to the dayjob, a Londonist staff member promptly reminded us of the Dark Screens site which documents the lost cinemas of South London. Oh well, our in-tray will just have to wait until Monday.